The Global Alliance for Improved Nutrition (GAIN)'s universal salt iodization (USI) program does not meet all of our criteria to be a GiveWell top charity but is a standout charity. Although we don't recommend these organizations as strongly as we do our top charities, they stand out from the vast majority of organizations we have considered. Since publishing this review, we have published notes from conversations with GAIN in October 2017 and June 2018. It has shared a large amount of information with us and allowed us to publish information about the challenges we have had in attempting to learn more about GAIN's impact. We have thus far been unable to document a sufficient track record of impact. We have found it challenging to fully understand GAIN's impact on USI programs. Because GAIN's activities vary across countries, we have attempted to focus on a small number of countries to start. The first two countries we focused on were Ethiopia and India. In both cases, we were unable to verify GAIN's contribution to improvements in the countries' iodization systems and, for Ethiopia, GAIN provided some information on key details that we found to be inaccurate when we visited salt mills in the country, which indicates to us that it would likely be very difficult to confidently understand GAIN's impact. What is GAIN's overall track record of improving iodization rates in the countries it has worked? What has GAIN's impact been in the four case study countries? Speaking with GAIN in 2012, primarily about an opportunity to fund the purchase of potassium iodate in Ethiopia. We published notes from two conversations in 2012, on June 5 and July 18. We did not ultimately recommend funding for the opportunity at that time. Contacting GAIN in 2014 as part of our review of the Iodine Global Network (IGN) (more).1 Greg Garrett, GAIN's Director of Large-Scale Food Fortification, sits on IGN's board. As we learned more about GAIN's work on USI from these conversations, we decided to invite GAIN to apply for a recommendation for this work. We have published notes from four conversations with GAIN in 2014: March 11, April 30, May 19, and June 19. Asking GAIN, in 2014, to submit documents to help us understand what activities the GAIN-UNICEF USI Partnership Project carried out, which actors were responsible for which activities, how much the work costs, what changes have resulted from the work, and the evidence for any changes. Seeking in-depth information about two countries in 2015, which were suggested by GAIN as illustrative of its impact. India: We spoke to GAIN's Regional Representative for South Asia, Dr. Rajan Sankar, and its Regional Associate in charge of USI in India, Arijit Chakrabarty (notes from the conversation). Spoke extensively with Alem Abay, GAIN's Country Manager, and spoke with Greg Garrett, GAIN's Director of Large-Scale Food Fortification. Spoke with staff from GAIN's USI partners in Ethiopia, including UNICEF and the Micronutrient Initiative. Traveled to the Tigray and Afar regions to visit salt iodization stakeholders, including two salt producers that had received donated equipment from GAIN (notes and photos from this visit). All content on GAIN, including past reviews, updates, blog posts and conversation notes, is available here. GAIN works to improve health through supporting the fortification of staple foods and condiments with essential nutrients.3 This page focuses exclusively on its work assisting universal salt iodization (USI) programs. GAIN's USI activities vary considerably across countries and include advocacy, technical assistance, providing supply-side support (e.g. supplying equipment, training government officials and salt producers), and oversight for government monitoring, among others. GAIN told us that it chose its target countries based primarily on the burden of iodine deficiency5 and the anticipated difficulty of increasing the amount and quality of salt iodization. We have not seen any additional information on how GAIN calculated the "additional reach" figures in the above table. We describe what we've learned about these four case studies below, including both what we know about GAIN's activities and about the impact of these activities. We have varying levels of detail on the activities described below. Detail on activities varies from concrete to vague and in a number of cases it was not clear to us whether the work was carried out by GAIN or by one of its partners. Except for Ethiopia, we relied on GAIN for the information in these cases. We did not seek to vet them with independent sources. GAIN shared a "sample monthly project monitoring report," which contains detailed information on the activities of an "Associate" in the Philippines over the period December 2013 to July 2014. We do not know if GAIN's work in the Philippines extends beyond the work of this employee. We discuss the meaning and weaknesses of these measures generally in our full report on salt iodization. Note: we did the bulk of our work on this page in the fall of 2015. In mid-2016, GAIN sent us final reports assessing the project's results. We reviewed these documents (linked below). They did not fundamentally alter our conclusions. We have included some information from them when it explains our current position. GAIN notes that overall, this shows a 2.5 percentage point increase in access to iodized salt in the 11 Partnership countries for which this information was available.54 There were large differences across countries, with some seeing large decreases in access (Ghana and Niger) and others seeing large increases (Ethiopia and Pakistan). We discuss the case of Ethiopia, the country about which we have the most information, in greater detail below. With the exception of the data from Bangladesh, which we discuss in more detail below, we have not vetted this data and in many cases, we have not seen the data sources cited. GAIN notes that at the time this review was published, a publication on this data is pending. Note that some of the data appears to be from sources that were created for other purposes (i.e. 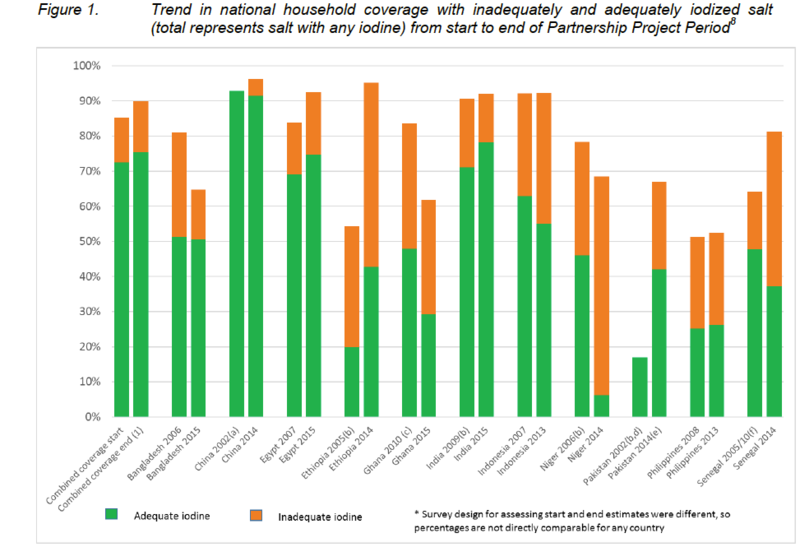 in many cases the data does not seem to have been collected for the purpose of evaluating the Partnership Project)55 and so may not be fully comparable between baseline and follow-up or across countries. In addition, we have limited information on the role GAIN played in many of the countries and its likely contribution to the changes over time. As discussed in the next section, we have also gained some limited understanding of GAIN's impact from four case studies. Because GAIN's activities vary considerably across countries, we have attempted to learn about GAIN's impact on a country-by-country basis. Of the four case study countries discussed above, we have spent the most time understanding GAIN's work in Ethiopia, primarily through a site visit to Ethiopia in July 2015. Overall, we would guess that GAIN's activities played a role in the increase in access to iodized salt in Ethiopia, but we do not yet have confidence about the extent of GAIN's impact. This is primarily due to (a) the difficulty in attributing impact to specific activities that GAIN carried out, and (b) challenges we have had in getting up-to-date and accurate information when relying on conversations with GAIN (as opposed to direct observation) about its work in Ethiopia. We also made a more limited attempt to learn more about GAIN's impact in India. We also present the limited information we have on GAIN's impact in Bangladesh and the Philippines. We have had extensive conversations with GAIN about its work in Ethiopia and visited GAIN in Ethiopia in July 2015. Below we discuss what we know about the impact of GAIN's activities in Ethiopia and the difficulties we had in verifying the situation on the ground through communications with GAIN. In this section, we focus on whether specific GAIN activities likely had an effect on iodization rates. Overall, we would guess that GAIN's activities played a role in the increase in access to iodized salt in Ethiopia, but we do not yet have confidence about the extent of GAIN's impact. We have not attempted to learn about the impact of GAIN's other work in Ethiopia, such as its advocacy to the government to improve iodization legislation and enforcement, its work with industry to improve iodization practices, and its support of a national survey of iodine nutrition. Because our assessment of GAIN's track record relies on statements from GAIN and others about what has happened in past programs, we visited one of the countries GAIN works in to audit our understanding of the situation on the ground. We found that our understanding about a key piece of the program, based on prior discussions with GAIN Ethiopia staff, did not match what we saw in Ethiopia. From this we concluded that it would be very difficult to verify GAIN's impact and we paused further work assessing GAIN's USI program. More specifically, prior to our visit to see GAIN's work in Ethiopia, GAIN Ethiopia staff told us that it had donated four salt iodization machines to the Kadaba Salt Supplier Share Company and that, based on reports from producers and some field visits, these machines were being used by the company.73 When we visited one of the machines, it appeared that it had not been in use for some time.74 It is our understanding based on a partner’s statement that it would have been possible for GAIN Ethiopia staff to know the machines had not been in use,75 but that GAIN's Ethiopia staff had not monitored the situation. Have salt iodization rates improved in India during the Partnership Project? Are changes due to GAIN's work? We spoke with GAIN staff familiar with its work in India in 2015 and asked for examples of how GAIN's activities in India had led to improvements in salt iodization.79 Overall, we find it plausible that GAIN had a significant impact on India's iodization rates, but we are not convinced that it did (and are less confident about its role in India than in Ethiopia). We felt that the most compelling case for GAIN's impact was its support of the Tamil Nadu Salt Corporation's (TNSC's) production of iodized salt for the public distribution system (PDS). GAIN told us that its &dollar;120,000 in funding attracted 3-4 times that amount of funding from the government, allowing TNSC to increase its yearly production capacity from 30,000 metric tons of iodized salt to around 60,000.80 However, given the large amount of government funding that GAIN claims to have leveraged, it seems possible that the government would have committed the funding without GAIN's support. In addition, we are unsure how much expanding TNSC's production capacity increased households' access to iodized salt. GAIN's work is largely (though not entirely) high-level – targeted at national policies and monitoring systems. It is difficult to connect these activities with factory-level and household-level changes. As in the other countries GAIN is working in, it is not entirely clear which activities were carried out by GAIN and which were carried out by other partners, particularly UNICEF. Our information on GAIN's work in Bangladesh is largely from documents GAIN shared with us. We have not discussed this program in depth with GAIN. Have salt iodization rates improved in Bangladesh during the Partnership Project? Median urinary iodine content for women of reproductive age and for school-aged children decreased between 2004-2005 and 2011-2012 in Bangladesh (140 to 123 µg/l for women, 163 to 146 µg/l for children), though in both years it was in a range that is considered normal.82 The studies also reported the prevalence of iodine deficiency in school-aged children and women (the study found small increases in both groups),83 however it is our understanding that iodine deficiency prevalence figures, as they are generally calculated, are problematic and cannot be taken at face-value.84 The 2005 and 2011-2012 surveys were both high-quality, national surveys, though they used somewhat different sample groups – the 2005 survey included pregnant and lactating women while the 2011-2012 survey did not, and the 2005 survey included children 6-12 years of age while the 2011-2012 survey included children 6-14 years of age.85 The same surveys also measured household use of adequately iodized salt (>15 ppm) and found that this rose from 51% in 2004-2005 to 58% in 2011-2012, though the use of salt iodized at all (>5 ppm) did not rise (it was about 80% in both surveys).86 Full methodological details are available for both surveys. GAIN also shared monitoring data from the Bangladesh Salt Iodine Information System (BSIIS). This data includes the percentage of samples tested that fell within various ranges of iodine content: below 15 ppm, 15-30 ppm, 30-50 ppm, more than 50 ppm, "BSTI" (20-50 ppm), and "Salt Law" (45-50 ppm). Below we present data for the percent of samples each month in the "BSTI" and "Salt Law" ranges, averaged by year.87 We do not know how this data was collected, how samples were selected, or the significance of the ranges. We would guess that falling in the "BSTI" or "Salt Law" range would qualify as a positive test result, with the latter being a stricter standard. The percentage of samples in the BSTI range has increased since 2010; the number of samples in the narrower Salt Law range was low throughout the period. The number of samples per month was significantly lower in 2007-2009, but has been fairly steady since 2010. It is difficult to assess if the observed changes are a result of GAIN's work. We have not yet seen high quality information on this question. We have not seen details of how this data was collected, which factories were included, what the timeframe for the change was, or whether the results were sustained. We discuss the potential negative effects of USI in our report on salt iodization. We have not closely vetted any data on GAIN's cost-effectiveness. GAIN estimates that in three of the four case study countries discussed above, it has expanded access to adequately iodized salt for &dollar;0.05 (India), &dollar;0.15 (Ethiopia), and &dollar;0.18 (Bangladesh) per person (an estimate for the Philippines was not available).89 We don't know how GAIN determined the additional reach over the project period, but it appears that this estimate uses the additional reach in each country over the course of the Partnership Project, which may be due in part to work by UNICEF, IGN, governments, and other actors, while the cost figures include only GAIN's costs. Based on its work in Ethiopia, we did a very rough cost-effectiveness analysis of GAIN's USI program to determine whether our model would find a significantly better cost-effectiveness for GAIN's USI program than for our top charities. We concluded that this was not the case.90 Note that our estimates for GAIN's USI program are significantly more uncertain than our typical cost-effectiveness estimates for top charities and we have not ruled out the possibility that GAIN's work is as cost-effective or more cost-effective than our top charities. Note: Below is our information on GAIN's room for more funding from 2015. In September 2015, we spoke with GAIN and got an update on its room for more funding. It is seeking about &dollar;1.6 million per year for the next four years to work in six countries and believes it could likely absorb more to expand to several further countries. More details in our conversation notes. Estimated needs: GAIN estimates that it could use up to ~&dollar;6 million per year over the next five years to support USI work in 14 countries. Cash on hand: We do not have a recent estimate of how much funding GAIN currently has available for its USI work. GAIN has been scaling down its USI activities due to lack of funds. Other sources of funds: The grant that funded most of GAIN's USI work recently ended. GAIN has some funding for more limited activities from two government aid agencies. Past spending: We have very limited information on how GAIN has spent funds on USI in the past. Additional considerations: GAIN's USI program is part of a larger organization and GAIN may be able to shift resources between programs, though we guess that the effect would be small. We do not know how GAIN has spent funds within any of the countries where it worked. * GAIN has said these annual reports may be available upon request. Email info@givewell.org if you are interested in viewing a copy. Note that IGN changed its name from the International Council for the Control of Iodine Deficiency Disorders (ICCIDD) in December 2014, so source documents and quotes may refer to the organization as ICCIDD. GiveWell's non-verbatim summary of a conversation with Alem Abay, April 14, 2015. GiveWell's non-verbatim summary of a conversation with Greg Garrett and Karen Ziffer, April 20, 2015. GiveWell's non-verbatim summary of a conversation with Greg Garrett, Karen Ziffer, and Alem Abay, June 9, 2015. "The Global Alliance for Improved Nutrition (GAIN) was established in 2002. It initially focused on scaling up nutritional interventions such as staple food fortification." GiveWell's non-verbatim summary of a conversation with Greg Garrett and Rizwan Yusufali, May 19, 2014. "Work in 14 countries is funded through the GAIN-UNICEF USI Partnership Project, which was GAIN's first foray into salt iodization. GAIN was the initiator of the USI Partnership Project, and the Bill and Melinda Gates Foundation ultimately funded UNICEF to work alongside GAIN, bringing with it its USI experience, particularly in policy and advocacy in salt iodization." GiveWell's non-verbatim summary of a conversation with Greg Garrett and Rizwan Yusufali, May 19, 2014. "The GAIN-UNICEF Universal Salt Iodization Partnership Project responds to this requirement for new models of salt iodization. GAIN and UNICEF received funding from the Bill and Melinda Gates Foundation in 2008 to contribute to global efforts to eliminate iodine deficiency through salt iodization in 13 countries with the lowest coverage of iodized salt and the greatest burden of iodine deficiency." GAIN-UNICEF Universal Salt Iodization Partnership Project. The Partnership Project selected countries in which to improve iodization programs based on household surveys and salt industry assessments. Currently GAIN uses data from surveys administered by other organizations, including the Demographic and Health Surveys (DHS), the UNICEF Multiple Indicator Cluster Survey (MICS), and government surveys. The USI Partnership Project is also developing its own data-collection capacity. It is rolling out five national surveys on household iodine coverage and is adding questions related to iodine to governmental or existing surveys in six additional countries." GiveWell's non-verbatim summary of a conversation with Greg Garrett and Jonathan Gorstein, April 30, 2014. "GAIN's current program portfolio promotes USI in 16 countries [later clarified that this should be 17 if Zambia is included] with high rates of iodine deficiency and low household coverage of iodized salt: Bangladesh, China, India, Pakistan, Indonesia, the Philippines, Russia, Ukraine, Egypt, Ethiopia, Niger, Nigeria, Ghana, Senegal, Afghanistan, Tajikistan, and Zambia. 14 of these programs are implemented as part of the GAIN-UNICEF Universal Salt Iodization (USI) Partnership Project. There were originally 13 Partnership Project programs, but Russia and Ukraine are ending early, and GAIN is adding a program in Nigeria instead. Similarly, UNICEF is adding programs in Sudan and Madagascar. GAIN's two target countries outside the Partnership Project are Afghanistan and Tajikistan. GAIN provided a small amount of support to Zambia (project closed in March 2014)." GiveWell's non-verbatim summary of a conversation with Rizwan Yusufali, June 19, 2014. "There were originally 13 Partnership Project programs, but Russia and Ukraine are ending early, and GAIN is adding a program in Nigeria instead." GiveWell's non-verbatim summary of a conversation with Rizwan Yusufali, June 19, 2014. Figures from GAIN presentation for GiveWell, Pgs 3-4.
contains more recent spending data from these countries that does not fully match GAIN presentation for GiveWell. We believe that the discrepancy may be largely due to headquarters and monitoring and evaluation costs being included in the country totals in GAIN presentation for GiveWell and being listed separately in GAIN USI funding summary by country for Gates Foundation funding, March 2015. "However, in 2008, GAIN's full time USI officer based in Ethiopia contributed to the dialogue as part of the National Iodine and USI Meetings where legislation was discussed weekly." GAIN Ethiopia narrative, May 2015. GAIN evidence of national improvement in USI programme in Ethiopia, July 2015, Pgs 6-7, Table: Supply. GAIN's first team member working primarily on iodization in Ethiopia was a consultant who started in 2011. In 2013, GAIN opened an office in Ethiopia and hired full-time staff to work on salt iodization." GiveWell's non-verbatim summary of conversations with Alem Abay and Greg Garrett, July 8-11, 2015. See GAIN report on a revolving fund for potassium iodate in Ethiopia, July 2012, Table 3: Amount and distribution of potassium iodate by partners in Ethiopia, June 2012, Pg 10. GAIN decided to do an assessment of the possibility of establishing a revolving fund in order to convince other stakeholders of the need for the fund and to learn how much KIO3 would be needed to seed the fund. The Ministry of Health (MoH) believed that 24 metric tons of KIO3 would be needed each year to iodize all of Ethiopia's salt. In September 2012, the MoH. GAIN, UNICEF, the Micronutrient Initiative (MI), and the Bill & Melinda Gates Foundation (Gates Foundation) met to discuss food fortification. At this meeting, on the basis of GAIN's assessment, the partners decided to institute the revolving fund. GAIN originally proposed that procurement for the revolving fund could be handled either by the MoH's Pharmaceuticals Fund and Supply Agency (PFSA), GAIN's global premix facility, or the private sector. Since private businesses had not already procured KIO3 at a large scale on their own initiative, the government was skeptical that they would be able to do so for the revolving fund. The government chose to run the tenders itself. PFSA was selected to host the fund. PFSA also procured and distributed essential medical drugs, so it was efficient to add KIO3 procurement to PFSA's mandate." GiveWell's non-verbatim summary of conversations with Alem Abay and Greg Garrett, July 8-11, 2015. "The revolving fund began in July 2012 with an initial donation of 22 MT (13.9 MT from the GAIN Premix Facility). GAIN also led on all logistics and negotiated the recovery of an additional 6 MT, reprocessed from the 12.6 MT of expired stock by Calibre Chemicals in 2013." GAIN Ethiopia narrative, May 2015, Pg 3. "GAIN has donated 6 Davey iodization machines and the equipment needed to run them as well as spare parts for the Glotra machines that were donated in the past by MI and UNICEF." GiveWell's non-verbatim summary of conversations with Alem Abay and Greg Garrett, July 8-11, 2015. GAIN agreement to donate iodization equipment in Afar, August 2014. "GAIN also provided 47 WYD devices and 8 new Bioanalyt iCheck® devices for robust quantitative iodine analysis. FMHACA inspectors were trained on titration methods as well as methods using WYD and iCheck® devices along with their calibration through a series of training workshops." GAIN Ethiopia narrative, May 2015, Pg 5. "The consultant was contracted design a training course and then travel to Ethiopia from the 9th of May 2012 to the 13th of May 2012 to train officers of the Ethiopian Food, Medicines and Health Care Administration and Control Authority (EFMHACA) and of the Ethiopian Health & Nutrition Research Institute (EHNRI) on the use and maintenance of WYD Iodine Checkers." GAIN training of trainers in use and maintenance of WYD iodine checkers in Ethiopia, May 2012, Executive Summary. "As a difficult, bureaucratic, and decentralized legislative and business environment, the passage of Ethiopia's mandatory salt iodization legislation was a major milestone that was unlikely to happen without the constant advocacy efforts by GAIN, UNICEF and partners. For several years, advocacy for salt iodization among producers and government officials had little impact. However, in 2008, GAIN's full time USI officer based in Ethiopia contributed to the dialogue as part of the National Iodine and USI Meetings where legislation was discussed weekly. In November 2008, these efforts resulted in a high level stakeholder meeting with regional and federal Ministers, landowners, and salt producers, which catalyzed a dramatic shift in attitudes towards salt iodization. This attitude shift culminated in a consensus and MOU between GAIN, the FMoH, and other Federal and Regional stakeholders, which clarified responsibilities. GAIN's USI officer continued to liaise with stakeholders, identifying and working to remedy roadblocks that occurred. Throughout 2009, GAIN identified key challenges and barriers to salt iodization, including poor coordination, technical and supply issues, and resistance from producers. GAIN worked in parallel to tackle these challenges via KIO3 donations, technical assistance, and advocacy to encourage industry acceptance. As part of its advocacy work, GAIN arranged meetings and gave presentations during board meetings of various salt producers' associations. This all resulted in a significant increase in the commitment and willingness of local salt committees and producers to iodize salt, as evidenced by their demand for iodization equipment and KIO3 as well as an increase in iodized salt production in many areas. GAIN also worked with federal and regional Ministers and officials to develop a blueprint for sustainable development of salt iodization. GAIN specifically contributed to the identification of constraints and the provision of recommendations for the commencement of salt iodization and related quality control procedures. GAIN was an active member of the National Technical Committee (NTC) to draft the legislation and revised salt standards for iodized salt. The legislation was submitted to the Council of Ministers in early 2010 and, after gaining industry support, it was approved and immediately implemented in February 2011. The success of this activity can be attributed to the timely advocacy and technical support GAIN and its USI partners provided during a very promising enabling environment, including a motivated Ethiopian Prime Minister and other high level officials who were very interested in addressing malnutrition and micronutrient deficiencies in the country." GAIN Ethiopia narrative, May 2015, Pgs 2-3. GAIN contracted the Iodine Global Network (IGN) to develop a QA/QC manual for Ethiopian salt producers and repackers. IGN subcontracted 3 consultants from Emory University to prepare the manual. The Emory consultants developed a generic manual, as well as standard operating procedures (SOPs) specifically designed for the current state of salt production and iodization in Ethiopia. One of the SOPs requires that processed salt not be stored directly on the ground to prevent the salt from becoming moist and losing iodine content. When GAIN staff first visited Shewit, they noticed that its bags of processed salt were sitting on the ground. GAIN recommended that Shewit store its processed salt on pallets, which minimizes loss of iodine content due to moisture. Shewit took the recommendation and began storing its processed salt on pallets. Shewit previously employed one chemist who both managed salt production and tested the salt. The SOPs advise greater specialization, and in early 2015 GAIN suggested to Shewit that it hire more staff and diversify their roles. Shewit now employs both a production manager and a salt tester. When GAIN and GiveWell visited Shewit, the salt tester correctly demonstrated the steps required to check the iodine content of salt using a WYD." GiveWell's non-verbatim summary of conversations with Alem Abay and Greg Garrett, July 8-11, 2015. GAIN industry QAQC progress monitoring matrix for Ethiopia, January 2015, suggests that GAIN may help a number of Ethiopia's salt producers improve their QA/QC in ways that could improve producers' salt iodization. However, we did not learn about the details of GAIN's QA/QC work with producers other than Shewit. Ethiopia's 2014 National Micronutrient Survey cost about &dollar;1.8 million. GAIN contributed about &dollar;100,000 for the measurement of indicators of iodine nutrition. The Ethiopian Public Health Institute conducted the survey after getting comments on its plan for the survey from all partners including GAIN." GiveWell's non-verbatim summary of conversations with Alem Abay and Greg Garrett, July 8-11, 2015. Intense sensitization of national level policy makers like Salt Commissioner of India, officials in Ministry of Health and Family Welfare (MoHFW) viz. Secretary, MoHFW; Joint Secretary (RCH), MoHFW; officials from Ministry of Commerce and Industries, and officials in Food Safety and Standards Authority of India, officials in the Ministry of Railways was undertaken. ICCIDD took up the concerns of the salt producers and traders with Salt Commissioner and other officials from the Salt Department. ICCIDD also facilitated the participation of Salt Department officials in meetings with traders and producers in Bihar, Gujarat and Tamil Nadu. ICCIDD and state focal persons undertook a series of activities viz. sensitization meetings with policymakers in Ministry of Health, Department of Food and Civil Supplies, Salt Trading Corporations, salt producers, traders and other partner organizations. Advocacy meetings were organized with Health Department officials and officials from Department of Food and Civil Supplies in all five states, with officials from Tamil Nadu Salt Corporation and Tamil Nadu Civil supplies Corporation in Tamil Nadu, and Rajasthan Civil Supplies Corporation in Rajasthan." Strengthening the supply chain of iodized salt through national and state level activities - India, Pg 2. "Supply chain of the iodized salt was considered as one of the weakest link in terms of monitoring and is vital in terms of ensuring the quality of iodized salt in the country. A project was launched by ICCIDD in five high priority states in support with GAIN in April 2013 to strengthen the supply chain of iodized salt… Intense sensitization of national level policy makers like Salt Commissioner of India, officials in Ministry of Health and Family Welfare (MoHFW) viz. Secretary, MoHFW; Joint Secretary (RCH), MoHFW; officials from Ministry of Commerce and Industries, and officials in Food Safety and Standards Authority of India,officials in the Ministry of Railways was undertaken. ICCIDD took up the concerns of the salt producers and traders with Salt Commissioner and other officials from the Salt Department. ICCIDD also facilitated the participation of Salt Department officials in meetings with traders and producers in Bihar, Gujarat and Tamil Nadu." Strengthening the supply chain of iodized salt through national and state level activities - India, Pgs 1-2. "The National Coalition for Sustained Iodine Intake, jointly supported by UNICEF and GAIN, continued to hold stakeholders meetings on a regular basis and carried out high level advocacy towards NIDDCF." GAIN-UNICEF USI Partnership Project Annual Report - Annex 1: Country Progress (Year 6), Pg 22. "UNICEF and GAIN enhanced its advocacy efforts to increase the availability and accessibility of iodized salt in the states. Various meetings and workshops were held at national and state levels to highlight the progress achieved, discuss future plans to overcome challenges, and to catalyze expansion of adequately iodized salt by engaging salt producers and traders. Intense sensitization of national and state level policy makers was carried out including the Salt Commissioner of India and high level authorities in the Ministry of Health and Family Welfare, Ministry of Commerce and Industries, Ministry of railways, Ministry of Food and Civil Supplies, and the Food Safety and Standards Authority." GAIN-UNICEF USI Partnership Project Annual Report - Annex 1: Country Progress (Year 6), Pg 22. "UNICEF and GAIN facilitated the constitution of state USI Coalition in various states. A State USI Coalition under the State Health Departments were newly formed in Bihar and Gujarat. In Uttar Pradesh, a technical sub-committee of the state USI Coalition was established which is working towards the constitution of state USI Coalition. In Tamil Nadu,a multi-stakeholder meeting on USI under the chairmanship of Director General of Health Services endorsed the formation of the state USI Coalition. The overall objective of the state USI Coalition is to ensure effective coordination and synergy among all stakeholders and key government departments involved in the USI Program." GAIN-UNICEF USI Partnership Project Annual Report - Annex 1: Country Progress (Year 6), Pg 22. "The Partnership is helping to expand the supply of adequately iodized salt through advocating to the Government to encourage the natural consolidation of the salt industry… GAIN has conducted a research scoping of setting up a National salt marketing cooperative federation." GAIN-UNICEF USI Partnership Project Annual Report - Annex 1: Country Progress (Year 6), Pg 25. Names of salt producers registered with the department"
GiveWell's non-verbatim summary of conversations with Drs. Rajan Sankar and Arijit Chakrabarty, March 12 and 31, 2015. "Salt MIS deployment need assessment and decision to implement was carried out by GAIN to investigate IT intervention as a possibility to enable salt department to have quick information available related to salt production and quality compliance, which is actionable and would aid the resources within department to further their objective of USI... The feasibility study clearly revealed that Salt Department's ability to respond to its business requirements was critically impaired due to lack of timely information and communication availability… VBSOFT India Limited along with ICCIDD undertook the solution development and deployment activity. A thorough study and close interaction with the stakeholders enabled VBSOFT to develop the software as per the requirements of the salt department including business process reengineering to enable MIS delivers intended efficiency and information… Hence in year 2013, GAIN funded implementation of capacity building program for salt department through VBSOFT & ICCIDD." Salt Management Information System - India, Pgs 1-3. "Over 95% people across salt department have completely shifted to MIS platform for individual roles assigned to them." Salt Management Information System - India, Pg 3. "Today about 90% of the salt inspectors are using the MIS, and the final 10% are in training. GAIN hopes that within the next few months, all salt inspectors will be using the system, eliminating the need for paper documents." GiveWell's non-verbatim summary of conversations with Drs. Rajan Sankar and Arijit Chakrabarty, March 12 and 31, 2015. An inspector from the Department of Salt picks up samples from each production level and deposits them at the labs. Salt producers voluntarily deposit samples with the lab so they can receive a certificate of quality, which entitles them to subsidized railway transport for their product and also provides external validation of quality, which may appeal to consumers. GAIN receives monthly reports from the labs on how much salt is produced, how much of that is iodized, how many samples are tested, and how many samples meet the standard being tested (which could be iodization, sodium chlorate content, moisture content, or presence of impurities, depending on the lab). If results show that a producer's output is poor, GAIN may send salt extenders or technical advisers to assist them. GAIN has produced a manual of do's and don'ts to help advise producers on how to improve. A producer that consistently fails quality tests may be officially warned by the government and eventually lose its registration. " "Historically, these labs have carried out salt testing, but their processes for quality control were not standardized. GAIN worked with the labs to create standardized internal protocols and external protocols for testing and provide all labs personnel with refresher training. […] GAIN held an initial round of training for lab technicians in 2009, and two refresher trainings have been held since then." GiveWell's non-verbatim summary of conversations with Drs. Rajan Sankar and Arijit Chakrabarty, March 12 and 31, 2015. "A 3 day hands on training workshop on 'Quality Assurance for the iodine content of salt in the laboratories of Salt Department, India' held at Gandhidham, Gujarat from 28th August to 30th August, 2009… Training workshop held for chemists of all laboratories of Salt Commissioner Department. Workshop attended by Salt commissioner and all deputy and assistant salt commissioners." Consultant work status report - India (October 2010). "Visits to 5 nodal laboratories by the Consultant from ICCIDD Reference laboratory made. Refresher training on Quality assurance was provided once again during these visits. On site inspection of the QA/QC protocols being followed at these laboratories were reviewed and corrective measures suggested." Consultant work status report - India (October 2010), Pg 2. GAIN USI believes that its involvement in networking the labs, organizing them to exchange and test each other's samples, and training lab technicians has helped improve the quality and quantity of the labs' output. In the first year of GAIN's USI program in India, the number of salt samples tested by the labs increased from 26,000 to over 100,000. Lab technicians feel validated when another lab confirms their findings, as producers frequently blame labs—particularly smaller ones with more limited facilities—when their products test poorly. Being closely linked to the salt producers, the labs are also able to advise the producers on how to improve the quality of their salt. Thus, GAIN considers it a top priority to maintain the lab network and the current system of internal quality control. GAIN believes that if it were no longer involved in the labs, the labs would continue operating as usual, although they likely need some form of external support to maintain their standards." "Reporting templates for internal quality and external quality assurance were developed." Consultant work status report - India (October 2010), Pg 2. "An inventory of chemicals, reagents and equipments at laboratories under Salt Commissioners made. Existing gap were identified and appropriate suppliers/vendors selected. The laboratories under the Salt Department were equipped with necessary (only gap supply) chemicals, reagents and equipments." Consultant work status report - India (October 2010), Pg 2. GAIN is currently using three to four consultant salt extenders, two in Gujarat and one each in Tamil Nadu and Rajasthan. Each salt extender is from his or her assigned state, knows the culture and language, and usually has some background in the salt industry. The extenders' role is to meet regularly with mostly large and medium-to-large salt producers in their respective regions, help train them on iodization, identify any problems they are experiencing with production or distribution, and arrange corrective interventions from GAIN or the government if needed. The extenders also engage with the salt commissioner and local government. Extenders spend about 12 to 15 days each month traveling around their assigned states and are paid approximately 40,000–50,000 rupees per month. Because salt production takes place in only two areas of Tamil Nadu and three areas of Rajasthan, the current small number of extenders can reach many, but not all, of the producers. The extenders are able to cover about 300 producers nationwide (150–200 in Gujarat, 60–70 in Rajasthan, and 20–30 in Tamil Nadu and nearby states), all of whom are either already iodizing or interested in iodizing. About 250– 300 producers are not currently reached. Areas in which salt extenders might assist or advise producers include sourcing potassium iodate, which can be scarce; allocation of rail cars for salt transport; upgrading technology; training on salt testing; and proper maintenance of equipment, such as cleaning nozzles on iodization machines. Salt extenders serve as a 'familiar face' for the producers, who appreciate having a consistent point of contact. Extenders also help organize producers for technical trainings when GAIN representatives visit. The extenders report to Dr. Chakrabarty in fortnightly and monthly calls and submit monthly reports to Dr. Sankar. These reports and information from the salt testing labs are the two ways GAIN learns about salt quality trends. However, producers are not compelled to give extenders access to their records, so extenders do not necessarily have complete information about industry trends." GiveWell's non-verbatim summary of conversations with Drs. Rajan Sankar and Arijit Chakrabarty, March 12 and 31, 2015. "Manual on best practices for QA/QC in salt iodization processes developed by global team of GAIN, in collaboration with Intertek-ICCIDD, was presented to Salt Commissioner and industry representatives" GAIN-UNICEF USI Partnership Project Annual Report - Annex 1: Country Progress (Year 5), Pg 13. GAIN is working with some state governments to begin making iodized salt available through the PDS, a network of 700,000 small shops throughout India that sell subsidized grains, sugar, kerosene, and other staple items, mostly to those living below the poverty line. Because the government can sell items without a retail markup, it can make quality iodized salt available to poor people without using subsidies. However, the government does not currently consider salt an essential item. Today there are 14 states in India that offer salt through the PDS, though not all of this progress can be attributed to GAIN, as the salt commissioner has also led this effort. These states include Rajasthan, Tamil Nadu, Chhattisgarh, Uttar Pradesh, and one division of Bihar, equivalent to about one quarter of that state. However, not enough quality iodized salt is available to supply the PDS, so only 5% of PDS beneficiaries have access to iodized salt. TNSC has historically not had the capacity to provide a steady supply of salt to the PDS, leading buyers to seek out salt in external markets, which was sometimes not adequately iodized. However, several NGOs, including MI and UNICEF, have helped TNSC build its capacity over the years, and the market for its products has grown as the quality has increased. About a year ago, GAIN provided about &dollar;120,000 in funding to TNSC, and TNSC was able to leverage that money in order to get three to four times that amount in cash from the government." "A business model to assure a sustainable supply and distribution of potassium iodate (KIO3)has been established and is beginning to gain traction. During the reporting period, the CIDDP procured 50MT of KIO3 through the GAIN Premix Facility using the project revolving fund with 100% cost sharing from salt producers." GAIN-UNICEF USI Partnership Project Annual Report - Annex 1: Country Progress (Year 5), Pg 2. "A final report of National Micronutrient Survey was disseminated on February 17, 2013. UNICEF and GAIN provided technical and financial support jointly. The report provided updated estimates of national iodized salt coverage in Bangladesh as well as data about the iodine status of women of reproductive age and school age children disaggregated by rural,urban and urban slum and by wealth index (data have yet to be included in the UNICEF global database on HHIS coverage)." GAIN-UNICEF USI Partnership Project Annual Report - Annex 1: Country Progress (Year 5), Pgs 2-3. "The Partnership advocated with the Government for endorsement of the revised salt law and for more rigorous legislative enforcement for production and marketing of iodized salt." GAIN-UNICEF USI Partnership Project Annual Report - Annex 1: Country Progress (Year 6), Pg 3. "Currently, the draft Salt Law is posted on the GOB website for all stakeholders' feedback. Government is aiming to submit a revised draft Salt Law to the Cabinet by early next quarter." GAIN-UNICEF USI Partnership Project Annual Report - Annex 1: Country Progress (Year 6), Pg 3.
producers to adopt and put the guidelines into practice within the next year. The Partnership supported the collection of salt samples from all short listed mills at production on a monthly basis in coordination with the CIDD Project and testing at CIDD lab. More than 650 salt samples have been collected each month from all short listed mills and tested at CIDD laboratories situated at eight salt zones. 15 to 20% of collected samples have been validated at Institute of Public Health Nutrition (IPHN) laboratory to ensure accuracy of analysis." GAIN-UNICEF USI Partnership Project Annual Report - Annex 1: Country Progress (Year 6), Pg 3. Retailers are sensitized and trained on use of RTK so that they buy only iodized salt from wholesalers and sell only iodized salt. In this project, communities will be sensitized through the orientation of adolescent school children using locally contextualized media." GAIN-UNICEF USI Partnership Project Annual Report - Annex 1: Country Progress (Year 6), Pg 4. "An audio-visual Mass Communication Package has been launched to improve awareness on the consequences of iodine deficiency and to promote use of iodized salt by consumers. A Docu-drama and a thirteen-episode TV serial on iodine nutrition have been televised through public TV channels." GAIN-UNICEF USI Partnership Project Annual Report - Annex 1: Country Progress (Year 6), Pg 4. "Associate was able to conduct a monitoring visit (see attached travel report) in Bacolod and Batangas and instructed both warehouses on the use of the QAQC software." Philippines activities (December 2013 to July 2014), Pg 2. "[Factory name] – a smaller pump had been procured and turned over to Salinas Pangasinan. A monitoring visit to the Salinas Batangas was conducted. The target iodization levels were within FDA standard but the standard deviation was high. Recommendations to improve were given." Philippines activities (December 2013 to July 2014), Pg 4. "[Factory name] – no regular recording; compressor, not dosing pump is being used; Warehouse was given 2 weeks to use the dosing pump and do recording (This deficiency was corrected by Cebu with support from DOST; However, while most iodine levels passed standard, significant number failed and control seemed erratic; Factory performance will be under close observation." Philippines activities (December 2013 to July 2014), Pgs 6-7. "Associate conducted monitoring of [factory name] and [factory name] factories (see attached mission report). There are indications that [salt company name] had issued a company-wide order to lower iodization levels to below 20ppm. This highlights the importance of fast-tracking strengthening of FDA regulations of the salt industry." Philippines activities (December 2013 to July 2014), Pg 8. "Associate conducted monitoring of [factory name] and [factory name] factories (see attached mission report). Discrepancies were noted in QAQC implementation, equipment management and reporting. Iodization levels were below 10ppm and there seem to be no urgent effort to improve. Associate recommended to DOST [Department of Science and Technology] to suspend QAQC certification of Artemis until the issues are addressed." Philippines activities (December 2013 to July 2014), Pg 8. "2 dosing pumps broke down in Cebu and Batangas. Associate sent 2 service pumps and requested to collect the broken down pumps for inspection by the distributor." Philippines activities (December 2013 to July 2014), Pg 2. "WYD Training for Region CAR set for August 14. 6 WYDs (3 fr GAIN, 3 fr UNICEF) will be provided." Philippines activities (December 2013 to July 2014), Pg 14. WYDs are referred to as "iodine checkers" elsewhere in the document. "Annual technical meetings among ITDI-DOST… The program for the national meeting is finalized and budget had been requested from GAIN HQ." Philippines activities (December 2013 to July 2014), Pg 14. "Provision of start-up fund to the ITDI employees association who will produce and sell WYD reagents – Accomplished." Philippines activities (December 2013 to July 2014), Pg 16. "Development of supply system for the procurement of replacement WYDs and Dosing Pumps – Partially accomplished." Philippines activities (December 2013 to July 2014), Pg 16. Associate presented draft plan to launch the SPS seal." Philippines activities (December 2013 to July 2014), Pgs 18-19. Associate conducted monitoring visit last April 9-12 (see attached travel notes). The two most important checkpoints had been verified to be functioning. One LGU has yet to determine the location of its checkpoint among two options. One checkpoint was determined to be as not too critical so WYD be be assigned to NNC region to test samples from different locations to validate effectiveness of the checkpoints. Despite being functional (and reports of shipments being turned back), many of salt samples collected by the Associate were below FDA standard. Associate is requesting for a review with NNC region." Philippines activities (December 2013 to July 2014), Pgs 20-22. GiveWell's non-verbatim summary of a conversation with Rizwan Yusufali, June 19, 2014. (d ) 2002 estimates for Pakistan did not differentiate between any and adequate iodine. Assume a proportion is inadequate. (e) 2014 estimates for Pakistan based on a MICS surveys in the two most populous provinces Sindh and Punjab (about 70% total population). Adequate and inadequate iodine based on RTK data. Bioanalyt data are available for a sub-set of the survey population however there were methodological issues that mean they are unreliable, however indicative of much lower coverage than by RTK. (f ) for Senegal the percent coverage with adequately iodized salt at the start is based on titration data from a 2010 survey and on RTK data for inadequately iodized salt from a 2005 survey" USI Partnership Final report, Pg 19. GAIN adds that "[the] baseline and updates only give a general idea of trend and can rarely be directly compared. In only 3 of the 9 countries (Bangladesh, China and Indonesia) was the methodology for analysing iodine content the same (quantitative) at baseline and update. In Ethiopia, Ghana, India, Niger and Senegal the baseline was from rapid test kits results and the update based on titration. In Pakistan, it was the reverse" GAIN email from Greg S. Garrett, October 8th, 2014. Senegal update (Q) - 2010-11 EDS-MICS" GAIN email from Greg S. Garrett, October 8th, 2014. USI Partnership Final report, Pg 19. "Increase in household coverage of adequately iodized salt from 72.5% to 75.0% (Figure 1)." USI Partnership Final report, Pg 19. See footnote above that details notes (a) through (f) in the chart. Also: "Rather than administering new iodine surveys at the beginning of its programs, GAIN used the most recent data collected prior to the beginning of the programs in 2008-2009. These data are widely accepted as the baseline data." GiveWell's non-verbatim summary of a conversation with Greg Garrett and Rizwan Yusufali, May 19, 2014. 2005 Demographic and Health Survey: 2005 Ethiopia Demographic and Health Survey, Pg 151, Table 11.6. Presence of iodized salt in household, "Inadequate (<15 ppm)" + "Adequate (15+ ppm)" = 34.4% + 19.9% = 54.3%. 2005 National Micronutrient Survey: Abuye et al. 2007, Pg 395, Table 5. Salt consumption and proportion of households with iodated salt according to region, "Households with iodated salt (%)," "Average." We assume that here "iodated salt" refers to salt with any iodine (as opposed to adequately iodized salt), because rapid test kits were used to conduct the testing; the term is not defined in the paper. 2009 Ethiopian Health and Nutrition Research Institute Survey: "Only 5 percent of households had salt with adequate iodization." Summary report on the 2009 Ethiopian Health and Nutrition Research Institute Survey, Pg 6. Note that we are not sure what standard for "adequate iodization" was used in this study. 2011 Demographic and Health Survey: 2011 Ethiopia Demographic and Health Survey, Pg 179, Table 11.9: Presence of iodised salt in household, "Percentage with iodised salt." 2014 National Micronutrient Survey: Ethiopian Public Health Institute presentation on 2014 National Micronutrient Survey, October 2014. Values for proportion of salt with any iodine and proportion with >15ppm are from Pg 18, Table: Validation of RTK with Titration (Gold Standard). "Titration value," "0 ppm" is 4.8%. The percentage of salt with any iodine is then 100% - 4.8% = 95.2%. Value for 20-40 ppm is from, Pg 22, Table: Iodated salt coverage Vs Ethiopian standard, "20-40." We have not vetted these studies, nor do we have the methodological details for many of them. We are not sure what would have happened if GAIN had not stepped in to help create the revolving fund. Since sporadic donations of potassium iodate from various donors had been the status quo, we would guess that those donations would likely have continued, at least in the medium term. In July 2011, the Ethiopian government requested 24 tons of potassium iodate (KIO3) from GAIN. GAIN had not planned or budgeted to donate this KIO3. GAIN reached out to various donors to seek funding for the KIO3, but it was not able to find much funding. GAIN believed that it was important to set up a sustainable system for KIO3 procurement rather than relying on one-off donations. Mr. Garrett and other staff met with Dr. Kesetebirhan Admasu, who at the time was the state Minister for Health and a key decision maker on KIO3 procurement. GAIN learned that some KIO3 that had been donated had later expired. GAIN traveled throughout Ethiopia to collect 12 tons of expired KIO3. GAIN negotiated with KIO3 producers to send the expired stock back to them for reprocessing in return for 6 tons of fresh KIO3. GAIN and partners convinced the MoH and government agencies partnering on KIO3 procurement that the KIO3 had expired because salt producers were not required to pay for it and so were not motivated to use it. GAIN originally proposed that procurement for the revolving fund could be handled either by the MoH's Pharmaceuticals Fund and Supply Agency (PFSA), GAIN's global premix facility, or the private sector. Since private businesses had not already procured KIO3 at a large scale on their own initiative, the government was skeptical that they would be able to do so for the revolving fund. The government chose to run the tenders itself. PFSA was selected to host the fund. PFSA also procured and distributed essential medical drugs, so it was efficient to add KIO3 procurement to PFSA's mandate. In other countries, GAIN has had mixed success helping to establish private companies or initiatives to procure and distribute KIO3. One such company continues to function in Ghana, but a distribution hub serving Kenya and surrounding countries did not operate in a sustainable way and has been closed. GAIN has learned that KIO3 procurement and distribution requires a large amount of capital, and that it is most efficient when combined with procurement of other products." @GiveWell's non-verbatim summary of conversations with GAIN's Country Manager for Ethiopia and Director of Large Scale Food Fortification, July 8-11, 2015@. "The revolving fund began in July 2012 with an initial donation of 22 MT (13.9 MT from the GAIN Premix Facility). GAIN also led on all logistics and negotiated the recovery of an additional 6 MT, reprocessed from the 12.6 MT of expired stock by Calibre Chemicals in 2013." GAIN Ethiopia narrative, May 2015, Pg 3-4. "GAIN took the lead on advocating for the revolving fund for potassium iodate." GiveWell's non-verbatim summary of a conversation with Arnold Timmer and Tesfaye Chuko, July 6, 2015. PFSA has run the revolving fund smoothly without needing much support from aid agencies since the agencies made their initial donations of KIO3 to seed the fund. At one point in the initial stages of KIO3 procurement, before procurement was institutionalized with PFSA taking the lead, supplies of KIO3 ran low and GAIN helped airlift one ton of KIO3 to keep the system running." Currently the revolving fund only sells each salt producer association enough KIO3 to iodize the amount of salt that its quota allows it to produce. Some of the associations in Afar have found that this is not enough KIO3 to meet their needs. In addition, KIO3 from the revolving fund is available only in small quantities to salt repackers such as Shewit. GAIN recommends that if the quota system for salt production is changed, access to KIO3 should be on a demand basis, and the market will eventually stabilize." @GiveWell's non-verbatim summary of conversations with GAIN's Country Manager for Ethiopia and Director of Large Scale Food Fortification, July 8-11, 2015@. "The revolving fund began in July 2012 with an initial donation of 22 MT (13.9 MT from the GAIN Premix Facility). GAIN also led on all logistics and negotiated the recovery of an additional 6 MT, reprocessed from the 12.6 MT of expired stock by Calibre Chemicals in 2013. As of 2015, the revolving fund and cost recovery mechanism are working well. A total of 54 MT of KIO3 has been successfully procured by PFSA without external resources in addition to the seed stock. PFSA is committed to having enough in stock to cover the national needs for 8 months of production. A request for the fourth round of procurement (totaling 40 MT) has been received by the FMoH from PFSA, providing evidence that the cost recovery mechanism has remained free of donor support since the initial KIO3 provision and the supply of KIO3 has stabilized within the country. The Ethiopian government has opened a dedicated bank account for KIO3 payments and salt producers have fully complied with prepaying for their allocated KIO3 prior to delivery. No KIO3 is known to have expired since the establishment of the GAIN- designed procurement and distribution system." GAIN Ethiopia narrative, May 2015, Pg 3-4. We have reviewed records of procurement from the fund and distribution from the fund from July 2013 to November 2014, which seem to show that the fund has continued to function: Ethiopian MoH iodized salt and KIO3 distribution data for July 2013, Ethiopian MoH iodized salt and KIO3 distribution data for September and October 2013, Ethiopian MoH iodized salt and KIO3 distribution data for November and December 2013, and Ethiopian MoH iodized salt and KIO3 distribution data for 2014. "The revolving fund provides salt producers easy access to KIO3. It is likely that at least some of these producers had difficulty accessing KIO3 before the revolving fund, when KIO3 was distributed to salt producers on an ad hoc basis. For example, when GAIN travelled around the country to recover expired KIO3, it did not find any KIO3 in the Somali Region. This may indicate that salt producers in the Somali Region did not have access to KIO3 before the revolving fund." @GiveWell's non-verbatim summary of conversations with GAIN's Country Manager for Ethiopia and Director of Large Scale Food Fortification, July 8-11, 2015@. "Currently the revolving fund only sells each salt producer association enough KIO3 to iodize the amount of salt that its quota allows it to produce. Some of the associations in Afar have found that this is not enough KIO3 to meet their needs. We believe that Kadaba would most likely have inadequately iodized their salt using knapsack sprayers, as the practice is widespread in Afar: "Almost all salt producers now iodize their salt, though many use knapsack sprayers that make it difficult to iodize adequately. Salt producers supported by GAIN in Somali iodize their salt with an adequate concentration of potassium iodate, as shown by a recent study. Salt producers in Afar, to whom GAIN does not provide direct support, generally do not adequately iodize their salt." GiveWell's non-verbatim summary of a conversation with Alem Abay, April 14, 2015. We are unsure whether Shewit and the salt producers in the Somali Region would have produced less salt, iodized their salt inadequately, or potentially not iodized their salt at all. "GAIN has donated 6 Davey iodization machines and the equipment needed to run them as well as spare parts for the Glotra machines that were donated in the past by MI and UNICEF. GAIN donated 1 Davey machine each to the Shewit Salt Supplier Private Limited Company and salt producers in the Somali Region, and 4 to the Kadaba Salt Supplier Share Company." @GiveWell's non-verbatim summary of conversations with GAIN's Country Manager for Ethiopia and Director of Large Scale Food Fortification, July 8-11, 2015@. See discussion above. Out of the four machines donated to Kadaba, we have the most information on the use of the machine that is easiest to access from the main road in the area. Our understanding is that the machine was installed in February 2015, used to iodize the two piles of salt closest to it, and then no longer used. Our best guess is that the other three machines donated to Kadaba have followed similar patterns of use. GiveWell's video of the Davey salt iodization machine donated by GAIN in use at Shewit Salt Supplier Private Limited Company, July 8, 2015 shows the machine in action on the day we visited Shewit. Our understanding is that the machine is used as a regular part of the salt production process. Salt production capacity of one Davey machine: "6 Davey machines X 10 MT X 8 hours per day X 22 days per month X 8 months (excluding the hot months of May- August when salt is not produced) = 84,480 MT." GAIN Ethiopia narrative, May 2015, Pg 4. 84,480 MT/6 = 14,080 MT. See above for our discussion of how much salt Shewit produces. "In 2014, Shewitt received support from GAIN to enable it to buy a Davey machine, which automates the iodization process and also increases production capacity. Previously, iodization had always been done with a less advanced Glotra machine of smaller capacity. 'The Davey is computerized, so it's programmable,' says Kidanemariam. 'The Glotra is manual and has a capacity of only 30 tons a day, but now with the Davey we have a capacity of 80 tons a day.'" GAIN article on eliminating iodine deficiency in Ethiopia. 30 tons a day is equivalent to almost 11,000 tons per year, if used every day of the year, compared with Shewit's annual production of 4,000 tons. We do not know when this machine was donated. According to GAIN summary of national salt production reports from 2012 to 2015, July 2015, salt production in Somali in 2014 was 11,339 metric tons. (1,328 MT + 500 MT + 1,573 MT + 1,316 MT + 1,824 MT + 1,824 MT + 2,974 MT = 11339 MT). As explained in the above footnote, the annual capacity of a single Glotra machine is about 11,000 metric tons. This understanding is from several conversations with GAIN. GAIN can verify if the machines are being used based on reports from producers and health care professionals, sending its field supervisors to perform random checks, and seeing the machines in action on scheduled visits." GiveWell's non-verbatim summary of a conversation with Greg Garrett, Karen Ziffer, and Alem Abay, June 9, 2015. GiveWell's photo of a Davey machine donated to Kadaba and the surrounding area, July 8, 2015 and GiveWell's close-up photo of a Davey machine donated to Kadaba, July 8, 2015 show that there were no apparent signs of the machine having recently been used for iodization, and that its generator was disconnected. GiveWell's photo of the tank for the potassium iodate solution attached to a Davey machine donated to Kadaba, July 8, 2015 shows that the tank was almost totally empty, suggesting that it had not recently been used. "I did not seem to have been used recently and the generator needed to power the machine was not present. [GAIN's Country Manager for Ethiopia] explained that the generator had been put into storage to protect it from the harsh conditions in Afdera until the machine was to be used." @GiveWell's non-verbatim summary of conversations with GAIN's Country Manager for Ethiopia and Director of Large Scale Food Fortification, July 8-11, 2015@. In response to reviewing a draft of this review, GAIN noted: "The Kadaba Salt Supplier Share Company used the machines at the launch but GAIN did not know that the machines had come to be disused and GAIN’s USI associate and field assistant’s contract was terminated due to end of the project and lack of funding shortly after the launch so GAIN did not have any way of verification other than the reports we received from producers as well as reports from practitioners visiting the project. Further, the 'Final USI Report' from 2012 indicates that there were some issues with ongoing maintenance of the machines because the ownership structure was through ASPMSA (Afdera Salt Association) and did not directly include the producers themselves. This seems to be a reason why they weren’t used as intended. This report also indiciates [sic] that because of ASPSC’s (Afar Salt Association) quota system, the machines provided were producing only at 41% capacity (proof that they were used at least during the beginning). Combined with the absence of a real maintenance schedule, spare parts, and personnel, the harsh environment of the salt sites contributed to frequent damage of the machines." Before we visited the machines, Henock Gezahegn, Country Director, Micronutrient Initiative (MI) Ethiopia, told us that, on the basis of reports from an MI field employee, he thought that the machines donated to Kadaba had not been used consistently and were not currently in use. He thought that due to Afari salt producers' lack of enthusiasm for salt iodization, the harsh conditions in Afar, the difficulty of using the machines, and the fact that salt iodization machines that MI previously donated in Afar are no longer in use, the machines donated by GAIN were unlikely to be used in the future. Henock Gezahegn, conversation with GiveWell, July 6, 2015. During our visit to Ethiopia, we visited the Shewit Salt Supplier Private Limited Company, which had received a donated iodization machine from GAIN. Shewit staff showed us a chart that indicated that the company had produced 41,066 units of salt in the most recent fiscal year. Mengistu Kihariam – Finance Manager, Shewit: "This is sales volume. In 1995, 2002 in the Gregorian calendar, it was 4.5 tons. Whereas last year it is 41.06 tons. Or, 41,600..."
Ben Rachbach – Research Analyst, GiveWell: "...Is that tons or quintals?" Mr. Kihariam: "This is in tons. You can consider this one 41.06 tons." Timothy Telleen-Lawton – Senior Research Analyst, GiveWell: "41 tons." Mr. Kihariam: "Because one ton is 10 quintals." Country Manager, Ethiopia, GAIN: "It's in tons, not in quintals." Mr. Kihariam: "This one?" (Pointing to the figure production figure of 41,060 for Ethiopian year 2006 on the graph) "No, no. This is 41,666." Country Manager, Ethiopia, GAIN: "Tons." Mebrhit Kiros – Production Manager, Shewit: "No, tons." Country Manager, Ethiopia, GAIN: [Words in Amharic] "No, it's in tons." Ms. Kiros: "We produce almost 200 quintals per day. So, this is in tons." Note that the years on the salt production chart are given according to the Ethiopian calendar, and Ethiopian year 2006 is years 2013-4 according to the Western calendar (see Calendar Converter). When we later looked at the photos, videos, and documents from Shewit, we became convinced that the units were in quintals (a quintal is 1/10 of a metric ton, so Shewit only produced 1.6% of Ethiopia's salt. GAIN industry profile - Shewit Salt Supplier Private Limited Company, April 2015, "Table 1: Trends in production amount and capital development over years," Pg 7, lists the same figure of 41,060 units of salt produced in 2013/14 as we saw on the chart at Shewit, and it lists the units as quintals. At 10:20 in GiveWell's video of conversation with staff and salt production records at Shewit Salt Supplier Private Limited Company, July 8, 2015, Mebrhit Kiros – Production Manager, Shewit showed us Shewit's daily production records for recent days. Ms. Kiros indicated that the units of mass in the records are quintals: "This is written in Tigrinya, but it is the type of salt, normal is iodized salt, and the amount in quintals in one day, 164 quintals per day, and this is variable because of different reasons, I think the power..."
GiveWell's photo of production records at Shewit Salt Supplier Private Limited Company, July 8, 2015 shows the document more clearly. We have not had the document translated, so we are not fully confident that we understand it. However, our understanding is that the third column from the right gives daily production in quintals. Daily production is highly variable, but seems to average about 200 quintals per day. If we assume that the factory is open 300 days per year, it would produce, very roughly, (200 quintals per day)*(300 days per year) = 60,000 quintals per year. This is much closer to 40,000 quintals per year than to 40,000 metric tons per year. Note also that at 23:30 in GiveWell's video of testing salt for iodine content, presentation of production data, and conversation with staff at Shewit Salt Supplier Private Limited Company, July 8, 2015, Ms. Kiros said that Shewit produces about 200 quintals of salt per day, supporting the above interpretation of the production records: "We produce almost 200 quintals per day..."
GAIN reports that "AIS (Adequately Iodized Salt) samples went from 72% to 76%" in India. GAIN presentation for GiveWell, Pg 3. We have not seen the underlying data, details of how it was collected, which factories were included, what the timeframe for the change was, or whether the results were sustained. A 2007 report states that 51.1% of households in India consumed salt with adequate iodine levels (Universal Salt Iodisation (USI) in India – Current Situation and Proposed Actions, Pg 4), but does not give details on how this data was collected. A national 2009 survey targeted only households with children 12-23 months old or where a woman had given birth in the past 12 months (UNICEF India Coverage Evaluation Survey (2009), Pg 5) – this survey found that 71.1% of households were using adequately iodized salt and another 19.3% were using salt that contained low levels of iodine, and the report provided in-depth information on how the data was collected (UNICEF India Coverage Evaluation Survey (2009), Pg 152. Methodology described on Pgs 5-12). GAIN reports that the rate of households using adequately iodized salt rose to 81.4% in 2012-2013, though it notes that the representativeness of this data is not known (India Indicator Matrix, Sheet PerformanceMonitoringFramework, Cells L10:M10). It is not clear to us whether the difference between the 2007, 2009, and 2012-2013 findings is likely due to progress in the coverage of iodized salt or to differences in how the surveys were carried out and what groups were targeted for each survey. Another study, from 2010, surveyed households in eight states that had been found in the 2005-2006 National Family Health Survey to have below average rates of use of iodized salt. It targeted rural households (Iodized Salt Coverage Study Conducted Across Eight States in India (2010), Pg 4). In these states, it found that use of iodized salt increased from 27% to 47% between 2005-2006 and 2010 (Iodized Salt Coverage Study Conducted Across Eight States in India (2010), Pg 7). The report gave only limited details on how the survey was carried out and we do not know if the comparison to the earlier survey is an appropriate one. "GiveWell spoke with Drs. Sankar and Chakrabarty of GAIN to learn more about the organization’s universal salt iodization (USI) activities in India, as part of an investigation of GAIN USI program as a potential top charity. Conversation topics included current progress toward USI in India, GAIN’s past and present efforts to encourage iodization, major funding gaps and priorities, and likely outcomes for iodization efforts if GAIN stopped or reduced its USI activities." GiveWell's non-verbatim summary of conversations with Drs. Rajan Sankar and Arijit Chakrabarty, March 12 and 31, 2015. Rah et al. 2013, Pg 8. 2004-2005: "The median UIE was 163 μg/L in children and 140 μg/L in women." Yusuf et al. 2008, Pg 623. 2011-2012: "However according to median urinary iodine concentration, which was above the cut-off for defining the deficiency (100 µg/l), indicated that Bangladesh as a whole on the total population basis was iodine sufficient, despite the fact that the trend in iodine deficiency prevalence was on rise. The median urinary iodine concentration in the school age children and the NPNL [non-pregnant, non-lactating] women were 145.7 µg/l and 122.6 µg/l respectively." Bangladesh National Micronutrient Survey (2011-2012), Pg 13. "The prevalence of iodine deficiency as measured by the proportion of the school age children whose mean urinary iodine concentration was below the cut-off mark of 100 µg/l was 40.0%. It appeared to have a rising trend from the 2004/5 data when it was 33.8%. In the NPNL women, the prevalence of iodine deficiency was 42.1%, which also has shown a rising trend from the earlier data when it was 38.0%." Bangladesh National Micronutrient Survey (2011-2012), Pg 13. "Although the median UIC is a good population indicator of iodine status, the distribution of UIC around the median in iodine surveys is often misinterpreted in an attempt to define the number of individuals who are deficient. A common mistake is to assume that all subjects with a spot UIC <100 mg/L are iodine deficient. But dietary iodine intake and therefore UIC are highly variable from day to day. In iodine-sufficient countries where most iodine intake comes from iodized salt, UIC (both spot and 24-h urine collections) show an individual day-to-day variation of 30–40% (Figure 3a,b). Therefore, in an individual whose average daily iodine intake is adequate to maintain normal thyroidal iodine stores, iodine intake will show wide daily variation that will result in many individual days when a UIC value will be less than adequate. Thus, even in populations in which iodized salt ensures adequate thyroid stores, there will nearly always be individuals with a UIC<100mg/L on the day of the survey, but they are not truly iodine deficient. This common error in UIC interpretation was unfortunately indirectly endorsed by WHO. When pushed to define the number of individuals with low iodine intakes in order to give prevalence estimates, WHO made the decision to classify all children in iodine surveys with a spot UIC <100 mg/L as having low iodine intakes. This allowed WHO to generate regional and global prevalence data, but the approach also led to the apparent paradox that a country like Switzerland, with a model iodized salt program, a national median UIC of 120 mg/L and a GR of <3% in SAC, is classified as having 'optimal' country iodine status, but at the same time 36% of the population is classified as having inadequate iodine intake." Zimmermann and Andersson 2012, Pgs 558-559. 2004-2005: "The survey population comprised of boys and girls aged 6-12 years old and women aged 15-44 years old." Yusuf et al. 2008, Pg 621. 2011-2012: "STUDY POPULATION: The pre-school aged children (pre-SAC; 6–59 months old), the non-pregnant non-lactating women of reproductive age (NPNL, 15–49 years of age), and the school-aged children (SAC; 6–14 years old)" Bangladesh National Micronutrient Survey (2011-2012), Pg 17. Pg 19 notes that NPNL women and school aged children were included in the sample for urinary iodine excretion. 2004-2005 survey: "Nationally, 81.4% of household salt was iodized (iodine content ≥5 ppm), and 51.2% of household salt was adequately iodized (iodine content≥15 ppm)." Yusuf et al. 2008, Pg 623. 2011-2012 survey: "About 80% of the households used iodized salt (iodine level >=5 PPM), while 57.6% of the households used adequately iodized salt (iodine level >=15 PPM)." Bangladesh National Micronutrient Survey (2011-2012), Pg 13. Data from Bangladesh Salt Iodization Information System. Summarized in Data from Bangladesh Salt Iodization Info System. Philippines case study, Pg 5. GAIN presentation for GiveWell, Pgs 3-4. We used this spreadsheet to create an estimate of the annualized cost for GAIN's program in Ethiopia and worldwide. We then used the result—a cost per person reached—in our standard cost-effectiveness model. Using most GiveWell staff assumptions this yields a cost-effectiveness relative to cash transfers of ~2-3x. "In 2008, GAIN received a &dollar;20 million grant from the Bill and Melinda Gates Foundation for its USI program as part of the Universal Salt Iodization Partnership Project. As part of the same project, UNICEF also received &dollar;20 million to work on USI advocacy and demand creation. This grant ends in 2015. The grant is ending this year. GAIN has spent approximately 90% of the funds. GAIN is using most of the remaining funds to complete national iodization surveys, assess household coverage, complete iodine special studies and disseminate this information in the countries where it works and globally. Around &dollar;300,000 remains for USI implementation in Ethiopia and &dollar;150,000 for Pakistan. GAIN will use some of these funds to buy lab equipment for the Ethiopian food and drug administration to test salt and provide training for regulatory monitoring. USAID granted GAIN &dollar;100,000 for work in Tajikistan over the last year. GAIN has already spent most of these funds. The grant may be replenished this year. GAIN is planning to use part of the grant it received from Good Ventures last year for its work with salt producers and regulatory agencies in Afghanistan." GiveWell's non-verbatim summary of a conversation with Greg Garrett, February 3, 2015. "Because future funding is uncertain, GAIN has started to let go of some of its USI staff members. GAIN would like to quickly obtain 'core' funding so it can bridge the gap and keep its critical USI infrastructure." GiveWell's non-verbatim summary of a conversation with Greg Garrett, February 3, 2015. "At both the central level and in countries, many GAIN staff working on USI have either left GAIN, reduced their hours, or reduced the proportion of their time that they spend on USI over the course of 2015. This is due to decreasing resources for USI and for GAIN's involvement in implementing programs that improve iodine nutrition." GiveWell's non-verbatim summary of conversations with Alem Abay and Greg Garrett, July 8-11, 2015. "Future funding possibilities GAIN does not typically rely on individual donors. It is actively looking for more funding for USI, but it has not identified any possible major donors. GAIN is finding opportunities to pitch USI to donors, such as USI as one part of a comprehensive approach to maternal and child nutrition." GiveWell's non-verbatim summary of a conversation with Greg Garrett, February 3, 2015. Greg Garrett, conversation with GiveWell, April 1, 2015. Greg Garrett, email to GiveWell, October 18, 2015. "We are not phasing out the USI program. Rather, while we had to significantly scale down our USI operations this year including letting some staff go due to our funding base decreasing, we will keep a small, core team on USI in place to provide TA [technical assistance] at a global level over the next two years. We will also have a small number of USI country consultants or staff in some specific geographies (e.g., Tajikistan Afghanistan). This is due to some funds for USI recently coming from USAID as well as a new fortification contract forthcoming from the EC. Of course we continue to actively fundraise and hope that we eventually increase our numbers and go back to providing critical TA for iodine nutrition in many more high burden countries." Greg Garrett, email to GiveWell, October 18, 2015. "We are not phasing out the USI program. Rather, while we had to significantly scale down our USI operations this year including letting some staff go due to our funding base decreasing, we will keep a small, core team on USI in place to provide TA at a global level over the next two years. We will also have a small number of USI country consultants or staff in some specific geographies (e.g., Tajikistan Afghanistan). This is due to some funds for USI recently coming from USAID as well as a new fortification contract forthcoming from the EC. Of course we continue to actively fundraise and hope that we eventually increase our numbers and go back to providing critical TA for iodine nutrition in many more high burden countries." Greg Garrett, email to GiveWell, October 18, 2015. "GAIN has very little unrestricted funding. All of the funding for GAIN's various nutrition programs is specifically allocated to those programs, rather than being funded by GAIN's unrestricted funds." GiveWell's non-verbatim summary of a conversation with Rizwan Yusufali, June 19, 2014. "While GAIN has provided some support to the USI in Zambia, we frequently don't include it as a USI program country because our level of support was small and the project was also utilizing some funds we already had in country on large scale fortification." Rizwan Yusufali, email to GiveWell, July 16, 2014. GAIN USI funding summary by country for Gates Foundation funding, March 2015. The countries are Bangladesh, China, Egypt, Ethiopia, Ghana, India, Indonesia, Niger, Nigeria, Pakistan, Philippines, Russia, Senegal, and Ukraine. The three countries where GAIN plans to spend the most are India (&dollar;2,066,074, 10% of total spending), Ethiopia (&dollar;1,467,588, 7%), and Ghana (&dollar;1,458,405, 7%).